Not too long ago, we published a post called “East 17 – Victims again?”. The impetus for that post was the firing of new East 17 lead singer Blair Dreelan from the band. Rarely has a new lead singer been fired during the interim between the first new single (featuring the lead singer) and the album. This has been perceived by many fans as a blow to the band. But it looks like the band has rebounded. Fans expressed their outrage when an official announcement was made on the East 17 website indicating that Blair had been fired. Many fans commented on the band’s facebook fanpage asking the band to bring former lead singer Brian Harvey back into the fold. It looks like the band has arrived at a solution – one that shines a positive light on their situation. Here is the essence of that situation. 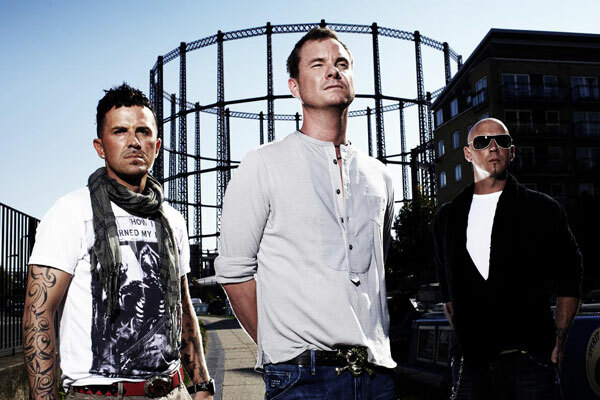 The band’s primary songwriter Tony Mortimer will take over as vocalists. The new single “Can’t you get off my mind” will be released at the end of January. The new album will be released at the end of March. The band has signed a 4-album deal. For those of you that have forgotten what Tony Mortimer sounds like as a vocalist, here is a video to remind you of that! Now let us just hope East 17 can recreate the quality benchmark that they set for themselves back in the 90s. We are definitely holding our breath for the new material. 4 Responses to "East 17 set to release a new single this month"
Desperate to hear the new album. Currently listening to Stay Another Day The Very Best Of East 17. It’s a cool album apart from 5 songs from the first album that are a bit repetitive namely – Love Is More Than A Feeling, I Disagree, Gotta Do Something, I Want It and Feel What U Can’t C. I Want It is my least favourite track of all. I would love there to be a remix album made of all their hits with some cool remixes! @Aron: I hope East 17 delivers on the new album. Brian Harvey’s vocals are definitely going to be missed but Tony Mortimer is a very competent songwriter. I just hope his creative well is even half as full as it used to be. Take a minute to check out the songs on the “Resurrection” album – especially “Each time”, “Betcha can’t wait”, and “Lately”. Last, but not least, thanks for your comment! a) They attempted a reunion 3 times PUBLICLY and failed all three times PUBLICLY (once after the punch-up; once after the 4 united for a one-off performance of Stay Another Day, and then after Brian’s replacement got sacked). Bands lose a LOT of credibility like this. The issue is not that these things happened but they happened PUBLICLY. Take That was way smarter about this when it came to Robbie Williams. They moved their recording process to America with Robbie and did things away from the limelight to make sure any potential fallout wasn’t made public. They had no delusions about how fragile their relationship with Robbie was despite all the new-found camaraderie among the members. b) Doing interviews and building a profile for Blair Dreelan (the new lead singer) even before an album was ready was dumb. There should have been no ambiguity of Blair’s future with the band before these guys started doing TV PR etc. for this stuff. Again, a credibility killer. Very hard to be taken seriously after that. c) Doing a LIVE album is a bold move. LIVE albums should only be done by very superior vocalists – not just decent vocalists. Tony Mortimer is a highly competent songwriter and a decent vocalist – but I think he was definitely way in over his head with a “live album” concept. d) In the late 90s, they did NOT quit at the top. The band (sans Tony) playing small club gigs to keep the cash flow going after the band ended as a commercial concern made it virtually impossible for them to ever become a stadium act again. I consider myself a massive East 17 fan. Their older material (including “Resurrection”) will always be on rotation in my personal collection as well as the radio station that we run (in case you haven’t noticed, this blog is part of a radio station with a global broadcast). Hence, it saddens me that they made a mockery of themselves even before they could be judged for their new music. The fact that all of “Dark Light” pales in comparison to the catalog these 4 Walthamstow dudes put out in the 90s makes their future as a band dubious at best. For Tony, it doesn’t matter. He’s loaded. He doesn’t need to work ever again. For Terry and John, this must be an unfortunate reality. For Brian too. Both he and the other three were naive to think that they could continue as separate entities.